ASB stands for long, turn-based space strategy matches for 1 to 4 players. Who builds the biggest interplanetary empire and prevails over the other players and the aggressive mutants? 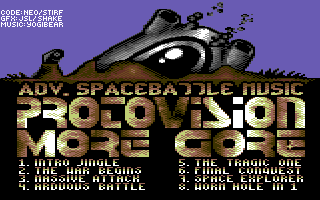 Two distinct game modes are available: In the Classic Version, a solo player or a group of 2 to 4 competitors fight against an evil computer enemy known as Deep Jones. The Advanced Version (where Deep Jones does not participate) is played according to more complex rules that require skillful planetary management: Investments in areas such as research, technological modernisation and defence must be balanced as to ensure adequate living conditions for the population. The historical development of each match is registered in a log file, allowing for later analysis via line charts. C64 or C128 in C64 mode, 1541/1571 Floppy. The window based user interface accepts mouse (optional), joystick, and keyboard input. The 4 Player Interface is not required. 1541 Ultimate, SD2IEC, uIEC/SD, IEC-ATA, 1581, CMD FD, CMD HD, CMD RAMLink, IDE64. 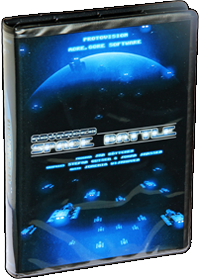 For all those of you who love playing Advanced Space Battle, More.Gore Software has a free-to-grab addition for you: two disks with gameplay scenarios, ready for you to load and play!